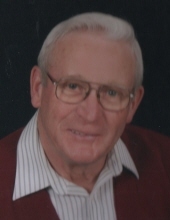 Fred "Fritz" LaVon Winger age 82 died Saturday January 12, 2019 at Mercy Hospital Janesville. He was born on June 13, 1936 in Viola Wisconsin the son of Fred E. and Edith (Salisbury) Winger. Fred married Carolyn McNamer on December 10, 1955 in Viola, Wisconsin. He worked for General Motors in Janesville for thirty years retiring in 1983 and was a member of UAW Local 95. Following his retirement at General Motors he worked for twenty years at the Evansville Golf Course mowing and maintaining the grounds. He loved the outdoors going on motorcycle trips with Carolyn, hunting deer with his daughter Lavonne and family. He enjoyed playing cribbage with his brothers. Fred was a member of the Congregational United Church of Christ, Evansville and the Evansville Woodchucks. Fred's love in life was his family and spending time with his children, grandchildren and great grandchildren. They will miss him dearly. He is survived by his wife Carolyn of 63 years of Evansville, his daughters; Leone (Bill) Draeger of Prentice, Lavonne Winger of Evansville, a son; Fred (Wendy) Winger of Janesville, grandchildren; Marissa (Brad) Raab, Ryan (Gerilynn) Draeger, Emily (Karim) Hassan, Adam (Carol) Winger, Rebekah (Travis) Morrison, Paige (Adam Schultz) Winger, ten great grandchildren, two brothers; Logan Winger of Gilman, Ronald (Laura) Winger of Janesville, several nieces, nephews and friends. He was preceded in death by his parents, a sister Esther Hart and sister in law Irma Winger. Funeral services will be held at 12:30pm on Thursday January 17, 2019 at the Congregational United Church of Christ in Evansville with Reverend Shaun Drefahl officiating. A visitation will be held from 10:00am until the time of service on Thursday at the church. To plant a tree in memory of Fred LaVon Winger, please visit our Tribute Store. "Email Address" would like to share the life celebration of Fred LaVon Winger. Click on the "link" to go to share a favorite memory or leave a condolence message for the family.